Separating the large and small galleries at Hemphill Fine Arts is a room so tiny that it might be better called a niche. Sometimes it’s empty, but at the moment it holds a small 1999 print titled “How to Survive Your Own Death (Whole).” Colby Caldwell made this array of random pixels, but not on purpose. It was an accident — one he has been exploiting for almost two decades. 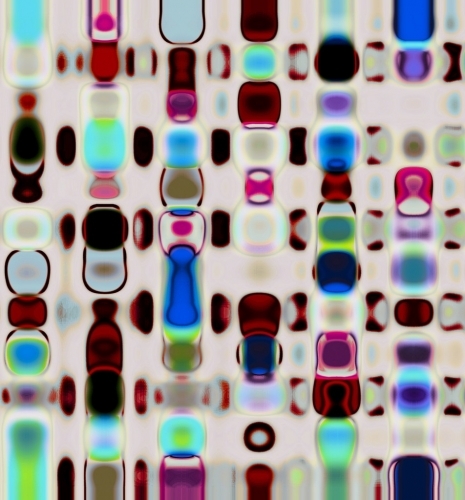 In these pictures, small blocks of color are enlarged until they become blurred lozenges, and the computer-generated forms begin to appear gestural. They’re paired with crisp, detailed photos of birds, moths and nests, posed on intense, single-color backdrops. The nature studies are magnified as grandly as the pixels, but not so that their images break down. The animals are dead, yet intact — memento mori that will live forever, or at least as long as Caldwell’s wax-covered archival prints survive. All paintings and photographs are frozen, of course, even the ones that capture or simulate motion. Caldwell’s work insists on this. There is no sense that the bird might rouse itself and fly away, or that the pixels might heal themselves and reassemble into the image they were before their corruption. One photo, “Shadow Shadowed,” ponders the marred, perhaps wooden exterior of — what exactly? It doesn’t matter. In Caldwell’s pictures of moribund animals and defiled data, there is no life beneath the immaculate surface.